Football fans in Florida are blessed in that we have three teams in the NFL–Miami Dolphins, Tampa Bay Buccaneers and Jacksonville Jaguars. I am a New England Patriots fan so whenever they come to Florida I try to get to go to the game. This weekend my bosses gave me an early Christmas gift–Two tickets to the Miami vs. New England football game. Dolphin Stadium is approximately 200 miles from Orlando. We started out around 8am and it is a straight drive on the Florida Turnpike. As we got close to the stadium, we noticed more local Dolphin fans. I think our car was outnumbered 50 to 1! Parking was a breeze and after walking past all the tailgaters having their parties, we went into the stadium and found our seats. We were in the “nosebleed section” (the football term for the seats in the highest part of the stadium.) My daughter, who attended the game with me, even joked that she was getting vertigo. Dolphin Stadium did not appear to have the same variety of food vendors that I have experienced at other stadiums, but there was enough choice to suit most football fans. The view, even from our high seats, was very good and you could easily see the entire field. After the national anthem, prayer and four military helicopters flyover, the game was on. It was a good match going back and forth, score for score. The Miami fans are very loud (to be expected from the home crowd.) Luckily there were enough New England fans around us so we could make some noise of our own. There are some friendly exchanges between rival fans and, occasionally, a not so friendly exchange. Football here is very family oriented–All ages and members of the family join in the fun. This is not something that you would see in the United Kingdom. I know my mother was horrified when I first told her I go to the local Alehouse to watch the games wearing my Patriots team jersey. She really did think that I would be beaten up. The Dolphin vs. Patriots game had four quarters, each 15 minutes long, and it was in the fourth quarter that we finally took the lead and kept it. Matt Cassel of the Patriots threw for over 415 yards and hooked up with Randy Moss for three touchdowns. Final score: New England 48 Miami 28. Yipee! In addition to the NFL, Florida also boasts some of the best college football in the nation. In January, the Florida Gators from Gainesville, FL will attempt to win their third national championship. The Miami Hurricanes from Miami, FL have won five national titles while the Florida State Seminoles from Tallahassee, FL have won two. Even the University of Central Florida Golden Knights (What is a “golden” knight anyway?) from Orlando, FL and the University of South Florida Bulls from Tampa, FL have achieved national attention in college football–And the Bulls did not even have a football team until 1997. Last Saturday, the college football ACC (Atlantic Coast Conference) Championship Game was held in Tampa. I took Mrs. LanceAround and Number One teenage daughter to Raymond James Stadium–Only an hour away from Disney and home of the NFL’s Tampa Bay Buccaneers and college football’s USF Bulls–To watch the ACC championship game. Even though both Florida State and Miami are in the ACC, the organizers of the ACC and the management of Raymond James Stadium were disappointed to discover that the contest would feature two teams from outside Florida: The Virginia Tech Hokies (Speaking of weird nicknames, do you even know what a Hokie is? I do!) and the Boston College Eagles. The Hokies, from Blacksburg, VA are a 12 hour drive from Tampa and the Eagles, from Boston, MA are a 22 hour drive. Attendance at the game was going to be low! What a game! The 17th ranked Eagles fell victim to the relentless, yet unranked, Hokies. The game was sealed in the fourth quarter when Jason Worilds of the Hokies knocked the ball out of the hands of Eagle quarterback Dominique Davis and a lucky bounce into the hands of Hokie Orion Martin resulted in a 17 yard touchdown runback for Virginia Tech. After that touchdown, Mrs. LanceAround, Number One and I walked down to the front row of the stadium, just behind the Hokies’ sideline to join the team in celebrating their victory. We watched as Jason Worilds painfully took off his shoulder pads, revealing his heavily taped and injured shoulder. 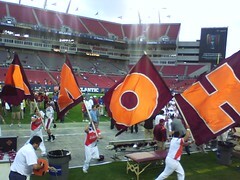 We cheered with the team as various fans threw oranges onto the field in recognition that the Hokies had won the right to play in the BCS Orange Bowl on January 1st. 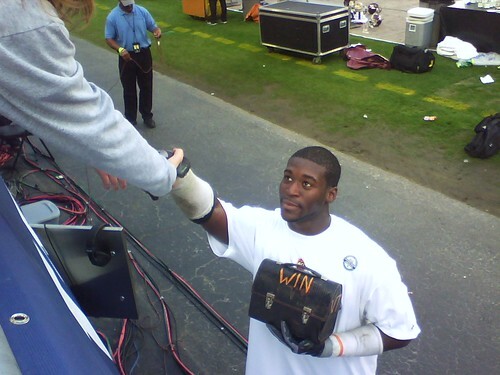 Jason Worilds even picked up the battered, rusty lunchpail with the word “win” inscribed on the side (a symbol of the Hokies’ hard, “working class” approach to their playing) and came over to shake the hand of Number One daughter and thank her for coming to watch the game. It was time for some father-daughter bonding as I attempt to maintain a positive relationship with number one teenage daughter. Mrs. LanceAround and number one daughter were nice enough to indulge me as they accompanied me to watch one of my favorite teams who was playing a game in south Florida. So I decided to do something nice for both of them in return. After the game, I drove them down to Key Largo, the first of the extensive Florida Keys that go from just south of Miami to “mile 0” at Key West, more than 100 miles from Key Largo. For number one, I had planned a snorkeling trip to the large coral reef off the east coast of southern Florida. 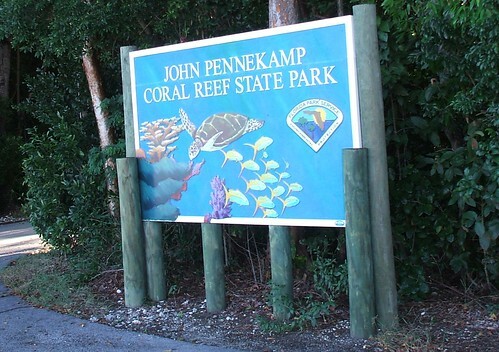 The trip sailed out of the John Pennekamp Coral Reef State Park. The park was only a half mile up the road from our hotel. We paid $3.00 a person entrance fee to the park and proceeded to the gift and snack shop to purchase our snorkeling tickets. There was also a nice sized visitor’s center that, alas, we did not have time to explore. 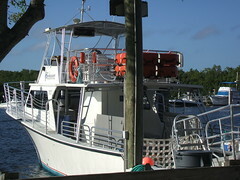 The park features rental boats as well as the group snorkeling trips, scuba trips and trips on a glass bottom boat. The staff in the park were very friendly and helpful. Number one daughter was in a frolicy mood as she played along with her father’s usual, feeble attempts at humor. When the person at the counter said that the waves were two feet high and we had to be good swimmers I looked at daughter and expressed concern that she had only a few minutes to learn how to swim. 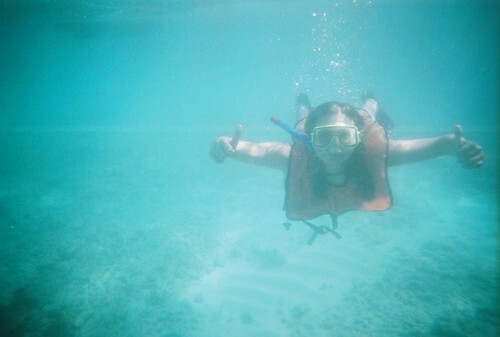 Daughter responded by appearing surprised that swimming would be a requirement for a snorkeling trip. The shocked expression on the counter-woman’s face was quickly replaced with a mirthful laugh as she caught on that she was just witnessing a father-daughter moment of bonding. And when she charged us the $72 for the trip for both of us including snorkel (that you get to keep) fins and mask rentals, everyone behind us in line had a chuckle as I gave my credit card to the woman and instructed number one to remember this moment the next time she is tempted to accuse her father of not loving her! After picking up fins and masks at the outdoor rental counter, we immersed ourselves in sunscreen and embarked on The Encounter with about 20 other passengers, one of whom was wearing a tee shirt advertising the maiden voyage of the Titanic. I wondered aloud whether anyone on board had seen the movie, Open Water. Only one other passenger and Captain Barry laughed, indicating that most had not! Who are those handsome people? After a five minute, very bumpy boat ride where passengers could enjoy standing on the top level or at the bow of the boat, we arrived at the coral reefs. The crew was pleasant, efficient and knowledgeable as they immediately gave clear instructions, got the seasoned swimmers into the water and provided a mini snorkeling lesson for the newbies. Number one daughter and I soon donned our snorkel, fins, mask and emergency inflatable vest and jumped off one of the two back ladders that were dropped into the ocean. A crew member was kind enough to snap a photo of us using the immersible camera number one daughter had purchased in the gift shop. The water was a balmy 77 degrees and felt fantastic. 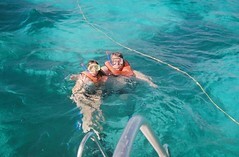 Number one daughter impressed me with her agility in the water and we were soon swimming above the shallow coral reefs. In some places it was so shallow your knees could scrape the coral. In other places, it was deep enough that it was difficult to dive to the bottom. Although we encountered some luminescent jellyfish, a couple of barracudas and a few schools of fish, I would have to say that the marine life was not very abundant. One of the other passengers later told us that she had seen a harmless shark, but no one else made such a claim. The reef itself was wonderful to look at. I have seen other reefs that had more color and more abundant sea life but my daughter was clearly having the time of her life as she would excitedly spot things and point them out to me. She took some excellent pictures. After an hour or so of snorkeling, we were feeling tired so we headed back to the boat which was never more than a few yards away. The crew gave us some books to help identify the fish and coral we had spotted and the 20 minute trip back to the dock was smoother than the bumpy, wavy trip out to the reef. After turning in our masks and fins, we drove back to the hotel for a quick shower before the noon check out time. Mrs. LanceAround had made the most of her morning, enjoying the quiet elegance of the hotel room as number one daughter and I regaled her with tales of our trip as we each took turns getting a quick shower. As we traveled to Robert is Here Fruit Stand and the Everglades National Park that afternoon, number one daughter resumed her more typical teenage angst as she sat in the backseat of the van moodily reading her favorite novel, Twilight, and momentarily forgetting just how much her father loves her.